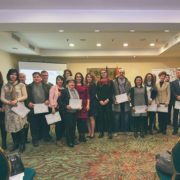 For the purpose of launching of the project „IRIS NETWORKing – CSOs for protection sensitive migration management, first partnership building meeting was held in Hotel Palace in Belgrade on 24th and 25th January 2018. The meeting was organized by IDC and attended by all project partners: Open Gate (FYROM), SOS Podgorica (Montenegro), LIR CD (B&H), ISC ARSIS (Albania) and ASB (Germany). The aim of the meeting was to strengthen the cooperation between project partners and communicate clear strategic goals for the following period. Partnership agreements were signed by all partners. The Agreements indicated operational basis for the functioning of the project team and stipulated roles and responsibilities of signatory parities, financial part of the agreement as well as technical and financial reporting arrangements. The Standard Operating Procedure is agreed indicating all relevant project implementation modalities to be used during implementation. The SOP is a “living” document and will be adapted during the course of the action depending on needs which might arise during implementation. Having the procedures set up at the early stage of the action will allow the smooth implementation of the entire project. It will simplify monitoring, evaluating and reporting on the project outcomes. Project is supported trough the European Commission Programme Consolidating Regional Thematic Networks of Civil Society Organizations. 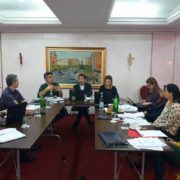 At the beginning of the year IRIS Network commenced new initiative within the project “IRIS NETWORKING-CSO for protection sensitive migration management” that is focusing on quality of the social service and policy improvement for the migrants in 5 countries of South East Europe (Albania, BiH, FYRoM, Montenegro and Serbia). Main objective of the project is to empower CSOs to be effective and accountable independent actors and to improve their capacity to dialogue with governments influencing policy and decision-making processes. The dynamic of the recent migration crisis exposed all challenges of the migration management systems, particularly visible in the lack of coherence of all stakeholders and in establishing inclusion mechanisms for those migrants who are residing for longer periods of time. Existing regional cooperation is seen only through security lenses of border management and police cooperation, with minimal inclusion of CSOs. Lessons learned in protection sensitive migration management are still to be communicated, considering uncertainty of existing and future migration issues. Therefore, CSOs will remain key players in the process of services provision and advocating more inclusive migration policies. Project initiative will affect the situation on two levels: a) enhancing the impact of civil society by strengthening capacities of CSO service providers for actively engaging in protection sensitive migration management and b) supporting structured civic dialogue with governments at all levels promoting CSOs’ involvement in public decision-making and reform processes in order to improve service delivery for migrant populations. In the next 40 months, Initiative for Development and Cooperation (IDC) from Serbia as the lead applicant, will be implementing the project in partnership with the Open Gate (FYROM), SOS Podgorica (Montenegro), LIR CD (B&H), ISC ARSIS (Albania) and EU based organization ASB (Germany). Project is supported trough the European Commission Programme Consolidating Regional Thematic Networks of Civil Society Organizations. IRIS Network is established in 2012 through the EU funded project within CSF Partnership Programme for Civil Society Organizations. In scope of this initiative, 200 CSOs network members will continue to facilitate and advance social services to vulnerable groups (people with disabilities, older persons, children and youth at risk, women victims of domestic violence and Roma), most of whom are migrants.